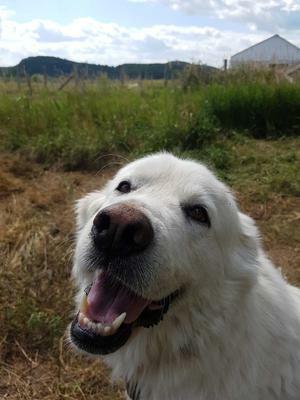 Sophie has been adopted to a farm where she will continue the job for which the Pyr was bred. It's a small farm so it will be lighter work for her. Sophie is 3.5 years old. She is currently guarding alpacas. At her previous farm, she was with sheep and horses. She is fine with chickens. She had two litters of pups but now she is spayed. 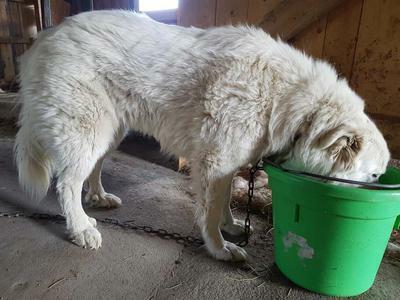 She is used to working with another Pyr which is how it should be since they need relief from their jobs. She showed positive for heartworm but it is not contagious. She is on interceptor year round and taking antibiotics and to be retested until it's under control. Note that healthy dogs do not make good hosts for parasites. She is good with cats, kids and adults. She is not house-trained (she has always lived outside) but this is easily remedied with a routine. Her people say she would be a good companion dog instead of a working dog. However, they don't see her in a city because of her barking at night. 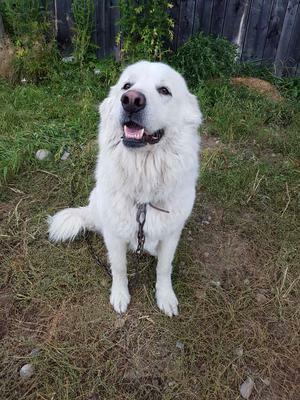 Barking is typical of a Pyr. If you are willing, this is something that can be managed but you have to be ready for it. Daily routine walks and playtime should help this as she matures. She walks well on leash. She has a tendency to jump on people but, again, with some work she will be fine. She understands ‘sit’. She is a bit uncomfortable and restless in a car, although she is fine in the cargo area of her car. With increased travelling in the car to good places, this should take care of itself. They require a good weekly grooming with a slicker brush and comb to keep them mat free and their skin healthy (hence, pain free from the pulling of mats as they move), and cutting their nails including their dew claws every couple of weeks to a month.They molt twice a year and all year round so your vacuum stays full. NEVER shave a Pyr. Their double coats keep them cool in summer and warm in winter. If you think your family is a good match for this pretty girl, please contact Valérie at 819.665.6276. If you would like to meet Sophie, please complete the adoption application. This will give us more information on you to determine if your family will make a good match.